The Great Beauty presents the quintessential European perspective on life and cinema. The contrast between European and American traditions of not only movie-making but living couldn’t have been more stark than in Paolo Sorrentino’s take on life, its meaning and its cinematic representation. How do you make a movie about nothing – a spiritual nothingness that is the most painful kind to feel and to narrate. The Great Beauty tells a story that can hardly be described in conventional storytelling jargon. 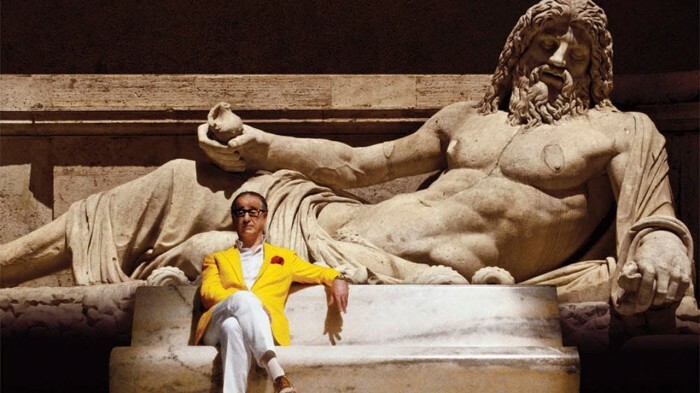 By not even attempting a progression of loosely tied events, Sorrentino does what many filmmakers would understandably shy away from doing (let alone devoting an epic 2.5 hours of screen time), namely a portrait of life with all its disappointments, resentments, pointlessness, hopelessness and lifelessness. This is not exactly entertaining material, nor is it an easy subject matter to tackle. And yet, Sorrentino does it like the masters of Italian cinema did it beautifully in the past. Fellini’s La Dolce Vita and 8 ½ and Antonioni’s La Notte are a few of the Italian masterpieces that are evoked by this modern incarnation. Similar to its predecessors, in The Great Beauty, Rome’s wealthy, intellectual, emotionally exhausted class of socialites suffers from an unbearable existential torment. As the historical and religious heart center of Europe, Rome and its eternal prisoners are buried under the weight of their own past. A perfect representative of the old and jaded breed of a European intellectual is Jep Gambardella – a successful journalist who had faded as a writer after his award-winning first book. Jep possesses the wisdom of someone who got so bitter that he has fostered the ability to see things from a higher perspective – the perspective of a sage who no longer struggles but simply accepts and flows with what life has to offer. It is striking that historically and culturally the European hero is the polar opposite of the American hero: old vs. young, hopeless vs. hopeful, unmotivated vs. enthusiastic, resentful vs. genial, aimless vs. goal-oriented, consumed vs. consuming, slow and ponderous vs. fast and buoyant; over-thinking and over-talking vs. relentlessly doing, doing, doing. In the same way, aesthetics of European cinema sharply opposes its American counterpart. If you watch The Great Beauty after watching a hundred American movies, it comes as a shock to the mind and the senses. The structure feels warped, the speed is confusing if not mind-numbing; you begin to feel, hear, and see all kinds of details that you never had the freedom to explore. You can feel the Roman cobblestones under your feet, smell the night air with its coolness and perfume, hear the night bugs forever chiming, notice the water trickling down the marble, feel yourself lost in the buzz and mist of a throbbing nightlife… Just like Jep, you feel like a wildlife observer in the city-bound wilderness of humanity. All without a story to crack open and consume to satisfy your insatiable mind. Sorrentino’s uncanny ability to completely ignore a cut-and-dried way of storytelling is remarkable and it is also typically European. His camera’s carefree, aimless, fluid, bee-like movement from moment to moment gives us time to see, enjoy and digest endless material without the interference of our rational minds constantly asking questions and seeking connection and meaning. The structure is more vertical than horizontal – a bird’s eye view of chunks of story; it feels like any given sequence could be isolated from the others, placed anywhere in the storyline and it would all still make sense. It is not a story per se, but a panorama, like a scientific micro-examination of certain cells representing the giant organism they belong to. All the stuff that makes European cinema, or art cinema, a tough audio-visual experience is handled so expertly that one is able to shake off the frown and the yawn and experience (rather than passively observe) life as it happens. Having devoured, studied and admired American cinema for so long, watching The Great Beauty took me back to my university days when I immersed myself in European cinema and thoroughly enjoyed Italian masters like De Sica, Rosellini, Fellini, Antonioni, Pasolini and so many others. (I confess I fast-forwarded my first screening of L’Avventura.) Having lived in Europe and in America, The Great Beauty reminded me how differently people can live life and express it through the movies. The fact that history and culture are so tightly ingrained in filmmaking is in itself a compassionate salute to humanity. The Great Beauty is evidence to how European it is to project human emptiness and misery on screen without much in the way of action; how European it is to talk about the importance of roots and “the embarrassment of being in this world”; how European it is to resort to numbness in the face of existential tragedy – “it’s just a trick”. The Great Beauty is a jolt to a conformist way of living, filmmaking and film-viewing. The simple honesty of talking about life as it is is the most energetic, refreshing and positive message to give a contemporary audience. It is so truthful and unapologetic that it is impossible to walk out of The Great Beauty and feel like you haven’t found ‘the great beauty’. But then again, Jep would be quick to remind us, it’s all just a trick.